Oh, I just twisted my knee a while back, but that didn't keep me from working on avatars! Never hesitate to ask for something if you want it. I see you chose my favorite one to use right now. 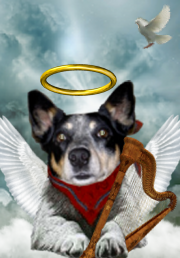 Brandi, if you feel up to it, could you make a Josef avatar of an angel with a halo and harp please. Just when you have a chance. Thank you so much for the Rainbow Bridge picture you did, it is posted now on my Facebook and will be my screensaver at work. I'd be honored to make your avatar design, JSM. I hope that poem and artwork will give you some peace at some point. I am so sorry it was Josef's time to go. You are a brave woman, doing what was right for him. These are so precious Brandi. I think JSM is going to love them. I have so enjoyed making Josef's avatars over the years. It did give me peace Brandi, thank you for doing it. I am not a brave woman, I just did what was right for him. If I was brave, I wouldn't be bawling like a baby right now. Thank you Brandi, I love them all, but especially his paw stuck in the harp, that's my Josef. I am not sure what size you need for a facebook profile picture; I googled the question, and got lots of different answers. I clicked on several profile pictures and they all seemed to be 180 pixels wide, so I redid yours to that width. I did not add animation to Josef's halo, because I doubt facebook allows animated gifs as profile images. Let me know if this is the correct size. But I put her on some Halloween backgrounds for you! Will post them on Oct. 1! I know..she is so lovely! how bout a thin mask around her eyes? would that be possible? If not, just leave her as is..ya can't fix perfect!